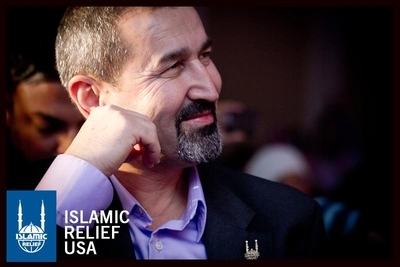 Yousef Abdallah is the East Coast Operations Manager for Islamic Relief, one of the largest Muslim charities in the world with dozens of branches. As a senior official of IR-USA, Abdallah frequently speaks on behalf of the charity in the media, at "peace-building" events, on Islamic television stations, and at dozens of different events across the country. Despite Islamic Relief's claims to be a moderate charity, its invitations to the White House and the hundreds of thousands of dollars of taxpayers' money it has received, the charity has a long history of promoting extremism and violent hatreds of minorities. Yousef Abdallah is a perfect example of Islamic Relief's duplicity. When he is not in front of the cameras at interfaith events, his private social media posts reveal an intense, violent anti-Semitism. 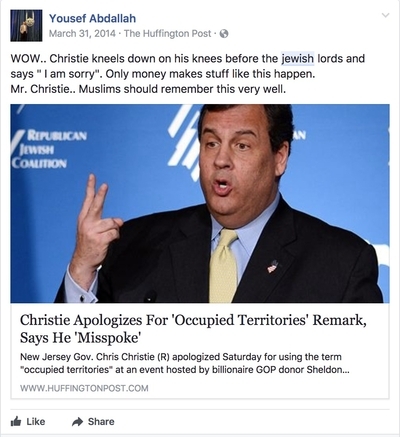 When Republican politician Chris Christie backtracked after referring to the West Bank and Gaza as "occupied," Abdallah wrote: "Christie kneels down on his knees before the jewish lords and says 'I am sorry'. Only money makes stuff like this happen. Mr. Christie.. Muslims should remember this very well." 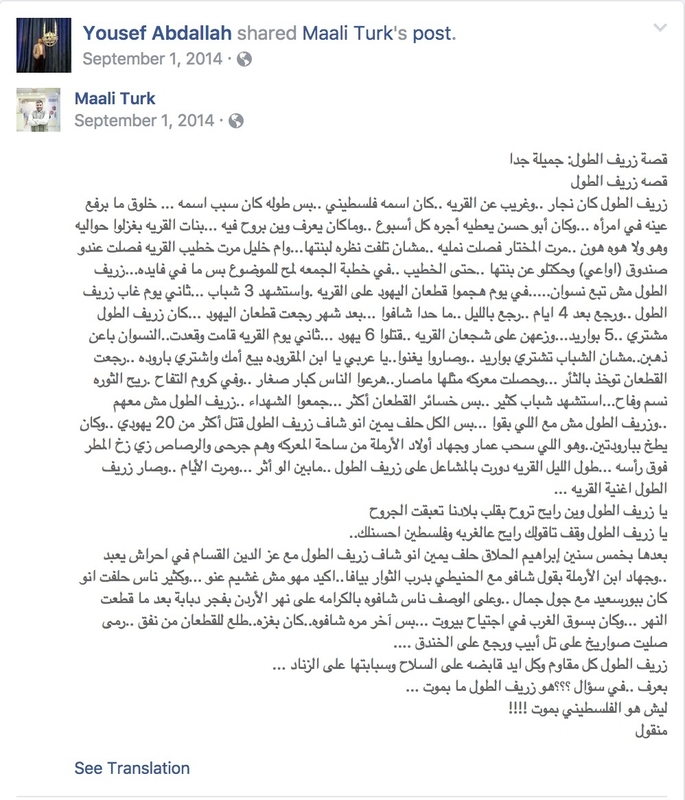 The most shocking post, written in Arabic, publishes a folk story of "martyrs" who provide guns to "kill more than 20 jews" and "fire rockets at Tel Aviv." At the top of Abdallah's post, the story is described as "very beautiful." 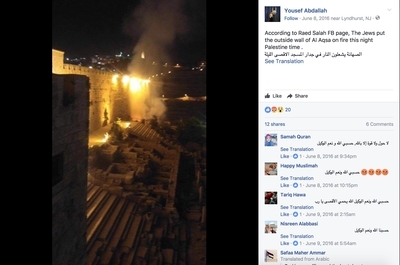 Other posts refer to Jews as "stinking," and claim "the Jews put the outside wall of Al Aqsa [the mosque in Jerusalem] on fire." Abdallah also 'likes' a comment on his Facebook post that calls on God to wreak "revenge on the damned rapists Zionists. O God they are no challenge for you . Shake the Earth beneath their feet and destroy them as you destroyed the peoples of ʿĀd, Thamud and Lot." This violent anti-Semitism and support for terror doesn't exactly seem to square with Abdallah's more public activities at "peace-building" events and interfaith gatherings. Islamic Relief is the largest Islamic charity in America and the Western world, reporting an income of about $110 million in 2014. But it is a designated terrorist entity in Israel and the United Arab Emirates. Banks such as UBS and HSBC have closed Islamic Relief bank accounts over concerns about terrorism financing. This year the United Kingdom's Charity Commission investigated Islamic Relief for its promotion of violent homophobia in sponsoring a series of talks by Imam Yasir Qadhi. Islamic Relief regularly encourages hatred against women, Jews, Christians, the LGBTQ community, and Muslims belonging to minority sects through their sponsorship of fundamentalist imams and activists at their events. Click here to see some rather vivid examples. Abdallah's hatreds are not an aberration in the Islamic Relief franchise; he is just another example of this Islamist charity's extremism.